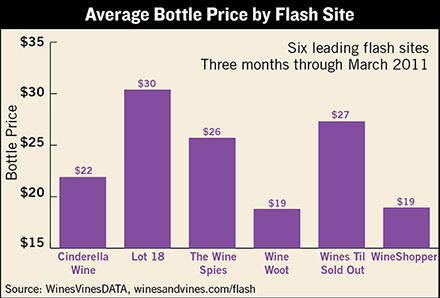 Consumers love flash wine sales sites for an obvious reason: the drastic discount prices. But what do the wineries that use flash sites think of them? Recently Wines & Vines solicited opinions about the sites from wine executives, and responses ranged from “a necessary evil” to enthusiasm—though most harbor mixed feelings about seeing their wines discounted and getting meager rewards. Like Boisset, Lisa Goff has used flash sites as a way to expose wines to new customers, people her wine company doesn’t usually encounter. She’s the vice president of marketing for the Crimson Wine Group, which owns Pine Ridge in Napa Valley, Archery Summit in Oregon and Chamisal Vineyards in the Edna Valley along California’s Central Coast. Russell does believe that luxury sites like Rue La La and Gilt should provide good brand exposure. “We like to see our brand associated with Dolce & Gabbana and Movado among people who want luxury but also seek deals,” she senses. She also has used invino, formerly called the Winery Insider. “They take their own photos, generate content and write their own notes. It’s relatively small volume, but invino is a licensed retailer and buys the wine.” Wine Spies is similar. The Santa Barbara County winery owner is especially enthusiastic about Lot 18. “Unlike some other sites, they stake their reputation on the wines they sell. They really qualify the wine and promote it. It’s really a high-end presentation,” says Murray. He adds that they take a higher cut for this effort, however. Like Russell at St. Supéry, Murray also thinks customers who buy from the sites wouldn’t be very responsive to letters anyway. He knows that the flash sites can undercut his wine club offers, but other than with that one site where he sent the mailing, no one has complained so far. 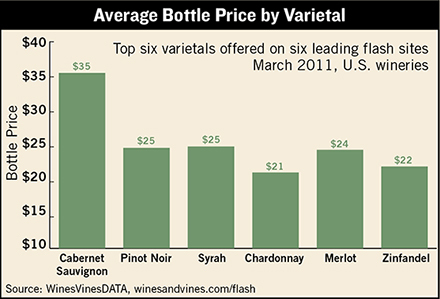 Murray has only dealt with marketing services, not Internet retailers who buy and then resell the wines. Still, he thinks the process isn’t a long-term solution for winery success. “I’ve been to that well a bit too much, I fear. I don’t want to be known as a discounter.” He adds, “It’s not a sustainable way to do business. It could work for a new winery or someone trying to sell inventory, but we’re going back to our core business: direct to consumer, wine club and distribution. It might work well for a new winery trying to get established,” he adds.